Andrew L. "Andy" McDaniel age 33, of Ashland, passed away early Sunday, May 27, 2018 at Ohio Health Med Central Hospital. He was born in Ashland on May 3, 1985, the son of Richard L. and Tracy (Hardesty) McDaniel. Andrew was a lifelong resident of Ashland and a 2003 graduate of Ashland High School. He was employed with Ashland Chemical LLC for the last 15 years where he was most recently the Material Manager. He enjoyed Tractor Pulling, Farming and Hunting. He also enjoyed spending time with his friends riding UTV’s, canoeing and cookouts. Andrew was known for always helping anyone he could. Survivors include his parents, Richard and Tracy McDaniel of Ashland; his significant other, Nicole Rafeld of Ashland, his daughter, Kyra Pauline Fugett of Perrysville; sisters, Heidi McDaniel and Fiancée Greg Cox of Ashland, Michelle McDaniel of Ashland; brother, Michael McDaniel and Fiancée Ranelle Johns of Ashland; his special nieces and nephew that he loved very much, Kierstin Cox, Olivia Cox and Oliver McDaniel; his grandmother, Donna McDaniel of Ashland; grandparents, Sterling and Irma Hardesty of Ashland; along with many cousins, Aunts and Uncles. Andrew was preceded in death by his grandfather William L. McDaniel. Friends may visit with the family at Heyl Funeral Home on Friday, June 1, 2018 from 4 to 8:00 P.M. Funeral Services will be held on Saturday, June 2, 2018 at 11:00 A.M. with Pastor Michael Namy officiating at the funeral home. 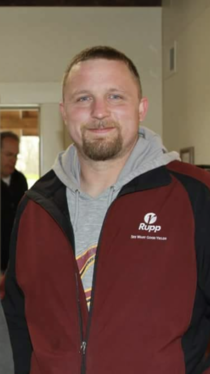 Burial will follow at Ashland County Memorial Park. There will be a Celebration of Andrew’s life and time of gathering at Mitchell’s Orchard directly following the burial. Memorial Contributions may be made in Andy's memory to the Cleveland Clinic Foundation Cancer Institute P.O. Box 931517 Cleveland Ohio 44193.